In this post, I will show you how we can simply create a simple Hello World standalone page/program and how to publish that web app privately or publicly over there. Please refer following steps one by one and create your first standalone Google App Script project. 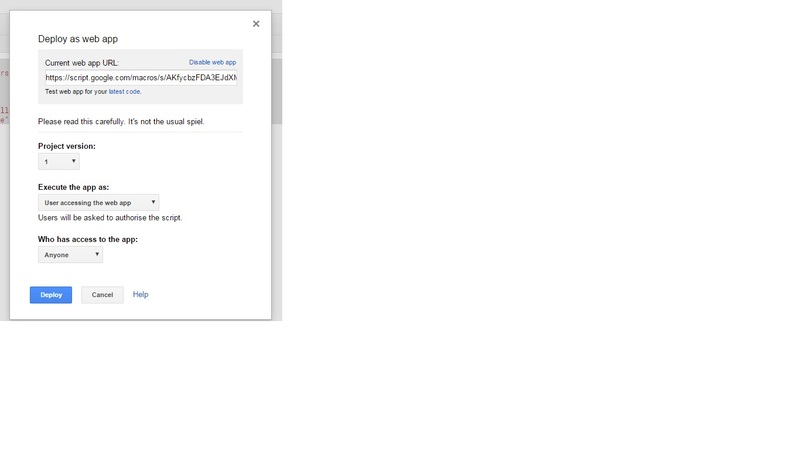 Step 1: First visit http://script.google.com if not logged in yet then please login by using gmail account. Step 4: Copy the following code in 'helloworld.html' file. Step 5: When you created the project first time there is a Code.gs file by default in the script editor. Click on that and copy paste following code in it. Very Important Note: We need to add doGet(e) function in Code.gs to publish project as Web App. This function uses HTMLService to return HTML Output of helloworld.html file that we created earlier. Now our script is ready to publish so do the following steps to publish it. 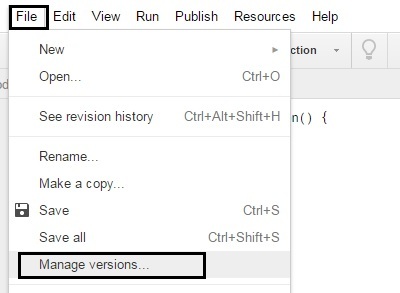 Step 1: Save a new version of the script by selecting File > Manage Versions, then Save New Version. For Example : type 1 there if this is your first build. 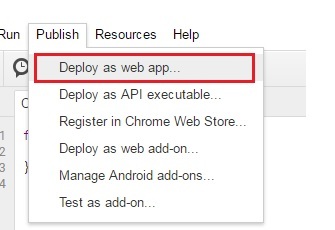 Step 2: Then select Publish > Deploy as web app. Step 3: You can see under Project Version, select the version you just saved above. Step 4: Under the 'Execute the app as', select the authorization for the app, means this app should be accessible by you only or it should be publicly accessed. Step 5: Under the 'Who has access to the app', you need to select who should be allowed to visit this web app. The options are differ depending on the type of account you have choose, but they can include "Only myself", any member of your domain, "Anyone" (with a Google account), or "Anyone, even anonymous". As you click on Deploy button, you can see a message indicating that your project has been successfully deployed as a web app. 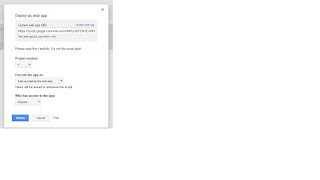 For testing execute that Current web app URL then you will see web page with Click Me button. When you click on that Click Me button you will get success message like below screen. I hope, it must be helpful & please share your feedback or queries in comments box. Thanks!